Police believe the laser pen which was aimed at a coastguard helicopter near Inverness as it returned from a rescue operation came from the city’s Merkinch area. A police spokeswoman said: “Police in Inverness are investigating a report of a laser pen being aimed at the UK Coastguard Rescue 951 helicopter over the weekend. “Around 3.25am on Sunday a green laser was shone into the cockpit of the helicopter, which was returning from a rescue on the Isle of Skye. The laser pointer is thought to have been aimed from the Merkinch area. “The use of a laser pointer in this manner is extremely reckless and such use could have dangerous consequences for the pilot, any crew and passengers on-board and also the general public. The helicopter had been scrambled along with the Mallaig lifeboat after a dinghy capsized off Skye. The two crew of the small vessel were found by staff from a nearby hotel. But their heroic efforts were overshadowed by the “idiots” who shone lasers at the helicopter crew as they arrived back in the Highland capital. The mission started just before 2.30am after the yachtsmen left the Hotel Eilean Iarmain’s public bar at Sleat. 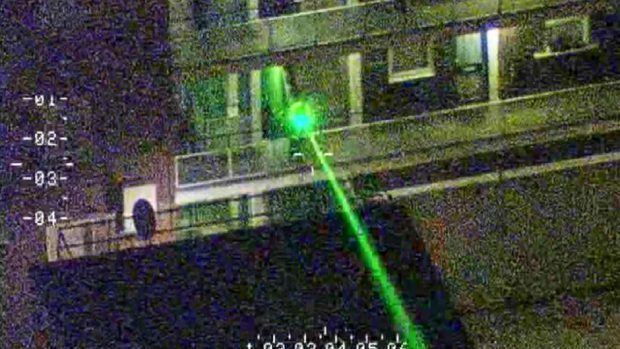 This is the second time police have connected a laser pen and helicopter incident with Merkinch. On January 31 a laser pen was shone into the cockpit of a Coastguard helicopter searching the River Ness for a man who had fallen into the fast flowing water. A spokesman for the force criticised the “extremely reckless” use of the green laser pointer, which was believed to have been aimed from the Merkinch area. The laser was shone into the cockpit of Rescue 951 at about 7pm, briefly distracting the pilot of the helicopter.